Well known for the reliability of our parcel delivery service, when it comes to shipping to Israel, you can trust DPD Local Online to deliver your parcel quickly and affordably. A small country located at the junction of Europe, Asia and Africa, Israel is one of our key parcel delivery destinations. And, thanks to our extensive courier delivery network, you can be certain that when you send a parcel to Israel with DPD Local Online, it’s in safe hands. 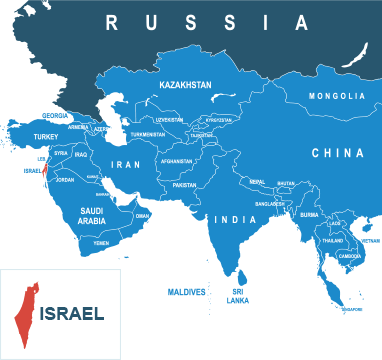 With both Hebrew and Arabic spoken widely in Israel, it can be really helpful to have an expert in international courier delivery to take over the necessary arrangements to get your parcel to Israel. We have plenty of information online to help you research how to send your parcel to Israel in the most convenient way, whilst our express and economy parcel delivery options put the power to control your budget at your fingertips. Just complete our easy-to-use online form to get your quote for shipping to Israel today. Do I need to deal with customs when sending from the UK to Israel? Your parcel will need to go through international customs when posting to Israel, which means it will need the appropriate labels and documents attached when you send it. Not to worry, though — when you book your delivery with us, we’ll send you all the documents you need for you to print off with your label. Easy! How much does it cost to send a parcel from the UK to Israel? It costs as little as £18.33 to send cheap parcels to Israel when you book through DPDLocal-Online. Plus, we have a range of options for you to choose from on all deliveries, from collection and drop-off services to express deliveries and signature tracking. Wherever you send your parcel, send it your way. How should I address my parcel for delivery to Israel? Addressing parcels for delivery to Israel is for the most part straightforward, but things get a bit more complicated when send to localities in the Palestinian Authority, such as the Gaza Strip or West Bank. In these cases, you’ll need to write “via Israel” at the end of the address. Need an example? You’ll find one here put together by the Universal Postal Union. For any further information, get in touch with HM Revenue and Customs. You should also refer to our prohibited items list for goods that can’t be carried by our couriers.